Whether you liked it, hated it or were completely indifferent (what’s that like?) everyone can agree that Jurassic World should have been a better film. 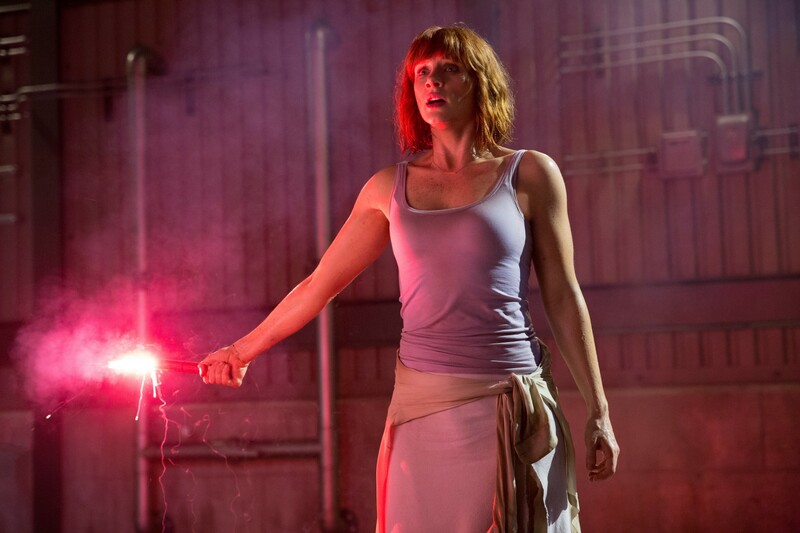 Colin Trevorrow’s blockbuster had all the ingredients to be better than it was, ingredients that led it to huge, record-breaking success in 2015, but the film itself squandered a great deal of its potential. Setting the quasi-reboot at a dinosaur theme park that’s been up, running and incident-free for years — bringing John Hammond’s dream to life — was a fantastic starting point, serving to raise the stakes and reintroduce the series with a flourish. When Ty Simpkins’ youngster Gray arrives at the park early on, excitably pushing through the crowds, mouth hanging open in awe, it’s a stirring sequence for any fan, with composer Michael Giacchino happily letting John Williams’s classic theme play out. We see a thriving park filled with guests. Crowds gather to watch a tyrannosaurus feed, whipping their phones out to film the gory spectacle, an audience erupts as a mosasaurus leaps to snap up a dangling great white, and at a petting zoo children ride adorable infant dinosaurs. This is Jurassic World. An animal reserve and resort serving up a once-in-a-lifetime experience to tourists from around the world, but one sold for a hefty price. It is a business after all, and businesses are first and foremost about making that sweet green. As Bryce Dallas-Howard’s buttoned-up Claire explains to potential investors, attendance at the park needs a boost every few years when interest starts to wane. So, backed by the suits funding this whole operation, Jurassic World’s geneticists have cooked up a new dinosaur: Indominus rex. Something bigger, louder, and with more teeth is needed to draw in the crowds, Claire tells us. It’s a clear and deliberate metaphor for the film itself, and blockbuster filmmaking in general. Fourteen years on from the last installment, it’s safe to say the Jurassic Park series had stagnated, so Universal brought it back with all the usual promises that this would be an adventure more thrilling and more action-packed than what had come before. This is a smart and interesting take, but Jurassic World fails to make its point with conviction because it never strikes a good balance between the corporate-mandated spectacle represented by the toothy Indominus, and the heart and soul of the film that started it all. So the money-first philosophy dominates the film, undermining the initial intent and dominating how World has been remembered. Jurassic Park wasn’t exactly an indie movie with reserved aspirations. It was designed to be every bit the success it became, but what secured it a lasting legacy was its rich characters and how well it brought its dinosaur attractions to life. These are the two areas where Jurassic World lets itself down. Trevorrow, along with fellow writers Rick Jaffa, Amanda Silver and Derek Connolly, struggle to give the film a strong central character because it willfully ignores the the better of its two leads. Following the runaway success of Marvel’s Guardians of the Galaxy in late 2014, Chris Pratt was emerging as a huge Hollywood star. His character Owen — a former marine conducting behavioral research on the island’s pack of four velociraptors — is repeatedly positioned as the archetypal badass hero who cracks wise and never falters, when he actually does very little. Owen saves an unlucky worker from his raptors early on, but following this he doesn’t really do anything significant. He saves only himself when the Indominus escapes, is more-or-less along for the ride during the next stretch of the film and fails in his coerced attempt to use the raptors to take down the escaped monstrosity. Even in the final act he fires only a few futile bullets before herding the film’s youngsters into the smallest, most vulnerable shack he could find, instead of the bigger buildings next to it. Claire is the true hero of the film. She saves Owen’s life in front of her nephews Gray and brother Zach (Nick Robinson), only for the pair to immediately favour the complete stranger. She later saves the pair’s lives when she’s behind the wheel of the van being chased by raptors, and in the finale she’s the one who frees the Tyrannosaurus, leads it to the Indominus and shifts the fight’s momentum. Claire has the most clear-cut, heroic arc in the film: starting out as a career-focused corporate type and going on to do all of the above while finding a newfound respect for the life of the animals she spends the first half of the movie calling “assets”. Initially she’s also a distant aunt, unable to remember Gray and Zach’s ages and leaving them with a minder as she works. It’s only when chaos engulfs the park that her thoughts do turn to the safety of her nephews, at which point they become her main concern. The emotional payoff should have been a family growing closer together. This does happen, but it plays out as secondary to the furthering of her relationship with Owen. The Jurassic Park trilogy never bothered with romantic subplots. Alan Grant and Ellie Sattler were sort of, maybe an item (it’s never explicitly said), in The Lost World Ian Malcolm is already in relationship with Sarah Harding, and in Jurassic Park 3 there’s no more than an estranged couple reconciling as they attempt to rescue their lost son. As that makes clear, the Jurassic series has first and foremost been about families. It was a huge misstep to turn Owen and Claire’s awkward flirtations into a relationship so quickly, purely so the film could end with a snog and a cliché. The imbalance between the treatment of Owen and Claire is so blatant it should taught in film schools. Whether the reason was Pratt’s newfound A-list credentials or simply old fashioned Hollywood sexism (it was both) the result is a groan-inducing study in how female characters are often overlooked and diminished in cinema. Perhaps even more important to a Jurassic film than the treatment of its human stars however, is its treatment of the scaly ones. In the original film Stan Winston’s team and the special effects pioneers at ILM brought dinosaurs back to life with love and care, through a mix of practical and computer-generated effects. These creatures felt like real animals, rather than movie monsters. The difference between an animal and a monster is central to Jurassic World. What the park’s lab cooks up is a hodgepodge of different genomes that would be Dr Frankenstein proud, rather than a recreation of any animal that actually existed millions of years ago. Every dinosaur on the island is a creation though, so is there really a difference? Does the fact they’re made in a lab make them property? Can anything that’s alive ever be contained? Do these dinosaurs share the rights of animals that occur naturally in the wild? Jurassic is about these questions and the murky debate between the right and wrong answers. Indominus is the product of those who believe they can own and control life, created by committee to turn a profit and sponsored by a mobile phone company. It clashes with the dinosaurs representing the “real deal”, and the film draws a clear line between the two. Fans naturally side with the dinosaurs they know and grew up loving. Rexy (the same Rex from the original film, in a nice touch) and Owen’s raptor pal Blue represent the spirit of the franchise, taking on the monster of soulless, corporate filmmaking. 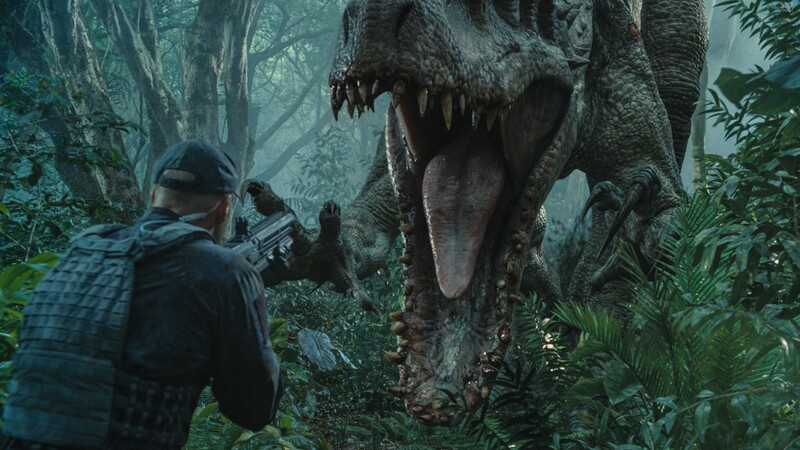 The intent is there but not the delivery, because Trevorrow and his team leaned too heavily on computer imagery that was too elaborate and hyper-real. It weakens the connection between the creatures being created and those in the audience. A connection that’s needed to support every argument the story wants to present. 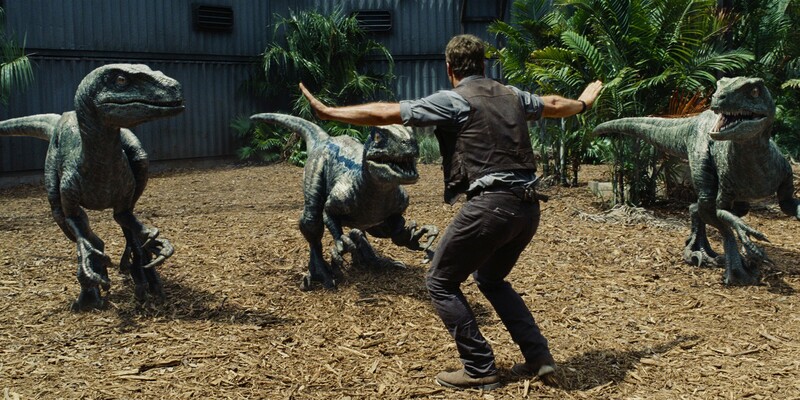 Jurassic World over-indulges in its computer-generated effects in a different way too. When we see a herd of gallimimus running through a field, flanking a vehicle carrying park-goers, they fill most of the screen. When Gray and Zach are in the gyrosphere, they’re surrounded by too many stampeding herbivores to count. There’s no space to let the visuals breath, so the busyness of the image makes it impossible for an audience to suspend their disbelief. We all know the dinosaurs aren’t real, but at least show them in a world that makes sense. There is a lot of this unnecessary CGI in Jurassic World, whether that’s too many dinosaurs in any given shot or a favouring of computer imagery over physical effects. This is the case in the petting zoo shot, a short sequence that could have had a greater impact were it made with entirely achievable real-world puppeteering. 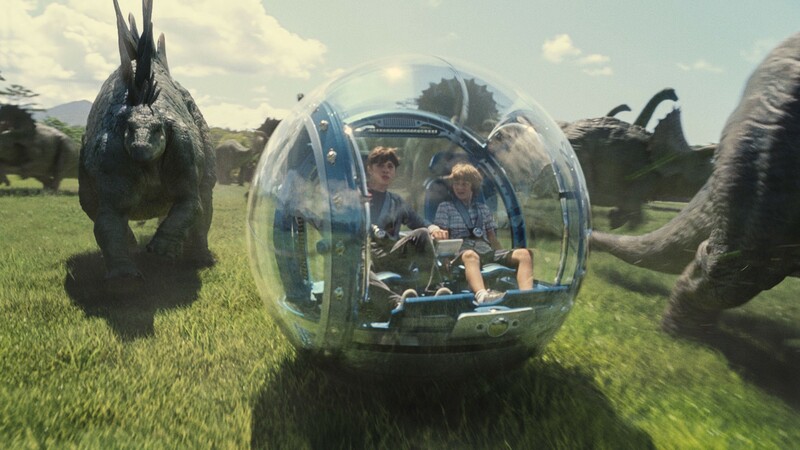 We could have seen the child actors riding animatronic dinosaurs, which would have created more authentic reactions, but instead we see them on CG creations layered over adults on all fours wearing motion capture suits. World never looks as good as its 25-year-old predecessor. The original’s visuals have aged well because the technology was used sparingly and smartly. Practical effects were favoured where possible and if used where possible — in pretty much any film — they will always look and age better. I still consider Jurassic World to be an perfectly fine film. It has some great set pieces and its ideas and intent are still in there, barely. There’s a clear reverence for the series too, which helps ease the discomfort of its worst moments (basically anything involving the military use of raptors is too dumb to care about). While the film succeeded in reinvigorating the franchise and setting things up nicely for J.A. Bayona’s promising sequel Fallen Kingdom — out this week — Trevorrow’s adventure remains a frustrating exercise in filmmakers abandoning all their best ideas in favour of cheaper, easier thrills. Or, to put all this another way, in Jurassic Park guests are given a guided tour by the voice of esteemed stage actor Richard Kiley. In his stead, Jurassic World opts for Jimmy Fallon getting slimed.